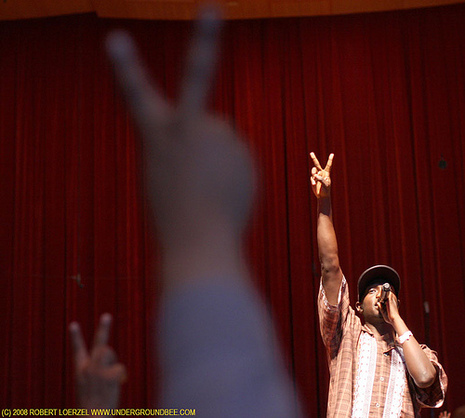 This summer, an unprecedented gathering of musicians from the East African nation of Sudan will come together in Chicago & Detroit to accomplish something politicians, war lords and diplomats have thus far failed to do: unify Sudan. Abdel Gadir Salim, Abu Araki al-Bakheit, Yousif El Moseley, Omer Ihsas, Al Balabil, Omar “Banaga” Amir, Ali Al Sigaid, John Kudusay, Dynamq, Mohamed Adaroab & the Nile Music & Dance Orchestra of Sudan plus special celebrity guests including former NBA star Manute Bol . Sudan, Africa’s largest country, is better known for its wars and civil strife than its spectacularly rich cultural traditions. This summer, Sudan’s greatest musicians and dancers are out to change that. The Sudanese Music and Dance Festival is a summit of superb singers, dancers and instrumentalists who believe that by bringing together their diverse arts, they can point the way to a peaceful and productive future for Sudan. In its second year, this festival will present in Chicago and Detroit a magnificent tableau of top-flight performers representing many regions of this unique African nation. These artists’ experience and virtuosity is matched by their passion, for their performances are literally aimed at changing the course of history. Dawn Elder Management, the International Sudanese Arts and Music Institute (ISAMI), and the Sudanese Information Center of Los Angeles are co-sponsoring the 2008 Sudanese Music and Dance Festival. Intent on remaining above Sudan’s fractious politics, festival organizers have specifically avoided the participation of any Sudanese government bodies, or any opposition political entities. ISAMI, an independent organization of Sudanese heritage artists, sets the tone with a singular focus on the development and welfare of Sudanese musicians and dancers around the world. 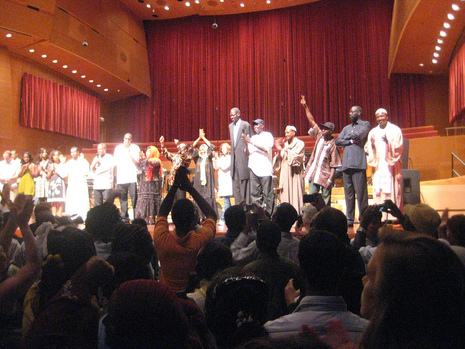 Featured artists in the 2008 festival include veteran singers Abdel Gadir Salim, Abu Araki Al Bakheit, Omar “Banaga” Amir Amir, and Ali Al Sigaid. 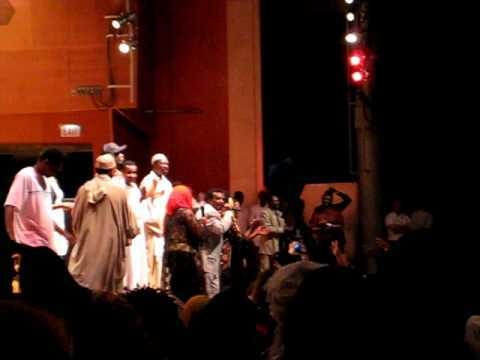 The legendary, female vocal group Al Balabil represents the ancient, northern kingdom of Nubia; Omer Ihas represents Darfur; the rapper Dynamq and also popular singer/guitarist/songwriter John Kudusay represent southern Sudan; Mohammad Adaroab represents the eastern region; and Rasha represents progressive trends in the Sudanese diaspora in Europe. All the performances will be accompanied by The Nile Music and Dance Orchestra, an amalgam of top-flight players from throughout Sudan’s worldwide diaspora, all under the direction of one of Sudan’s most established composers and producers, Yousif El Moseley. As a crowd-pleasing bonus, NBA Basketball star and social activist Manute Bol—who was born in Sudan—will share the stage with these extraordinary artists in their Chicago show. Sudan has the largest landmass of any African country as well as one of the most diverse populations, with some 300 ethnic groups living in deserts, mountains, and along the shores of the Nile River. In ancient times, the north was the Kingdom of Nubia, with close ties to Egypt and the Arab world, and the south the territory of African agricultural groups, such as the Dinka, Shilluk, Nuer, and Azande. The south was physically cut off from Nubia by the nearly impassable swamplands of the White Nile. These two distant worlds became politically joined when Egypt annexed Sudan in the 19th century. When Britain then occupied Egypt in 1898, it claimed Sudan without so much as a fight. The trouble was, neither occupier ever sought to forge an overarching, Sudanese identity. Arguably, until its independence in 1956, Sudan was a single nation in name only. Given this history, fair and effective governance was out of reach for the early leaders of independent Sudan. A series of military and civilian governments rose and fell in quick succession during the first thirty years. Power tended to center in the Muslim north, and after the government imposed Sharia law in 1989, people in the Christian south felt radically disenfranchised and victimized. The Islamist government that has ruled since 1989 has been stable, but harsh, dividing the country further through a strategy of unequal development that has neglected many regions, notably the south, and the western province of Darfur. These policies have only heightened underlying ethnic and religious tensions. After much strife and conflict, the north and south established a fragile peace accord in 2005. Meanwhile, new fighting has surged in the West, in Darfur, and the world’s attention has focused there. The artists participating in the Sudanese Music and Dance Festival believe that these conflicts must be understood as pieces in a larger puzzle, the puzzle that is Sudan. Today, with the North-South Peace Accord as a model to be applied in Darfur and elsewhere, many Sudanese sense an opportunity to at last build a nation. Much depends on an ability to lay aside the divisions of the past and begin an era of healing and unity. These artists intend to show the way. For more information, call 312.742.1168 or visit www.millenniumpark.org.